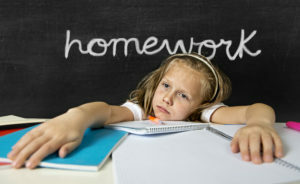 You are here: Home / Education / Is Too Much Homework Bad for Kids? Is Too Much Homework Bad for Kids? Why weren’t my parents reading articles like this when I was in school! Back then, it was no play until the homework is done. That’s pretty much how it was when I was a kid for everyone across the board. You went to school, you got homework and you did it. No fuss, no if and’s or butts…you did your homework and the amount of homework you had didn’t matter. Not once did my parents ever say to me…”Hmmmmm…seems like you have too much homework. I wonder if this is bad for you” – although I wish they had. Like most children I did not like doing homework. With that said, when I was a kid ( we won’t say when that was), we really didn’t have half of the school work that kids get now. The rolling luggage bags kids bring to school should be a dead giveaway that all bets are off and the pressure is on even at a very young age. Kindergarten children are look as if they are late for a flight as they wheel around their luggage carts running for class. I think…if anything, back in kindergarten, I carried “a book” and that’s a maybe. I have seen some of the homework kids get these days in grade school. This is rather embarrassing, but I’ve had to google a few times how to do math problems or performing grammar checks. By the time children are in 6th grade, they have as much work as I had in college. Are we bogging our kids down with too much homework or is it good for them? That’s a really good question that I’m sure people have different opinions on. It’s not uncommon these days to walk into a school nurses office and witness children having panic or anxiety attracts. There is so much pressure on these little guys and it starts so early for them. Do you notice this at home with your children? To see what this mom says…CLICK HERE.